Posted: May 27th, 2013 under ApSIC Xbench. There is something unconventional in Xbench 30-day trial that we would like to share with you: Xbench 3.0 trial days refer to real use days, not to calendar days. As you know, the traditional 30-day trial is the exploding one: you start it and 30 days later it is over. It does not matter if you did not find the time to actually evaluate the software at all. It effectively means that, in many cases, you barely are able to test if installing and uninstalling works. When we set up the Xbench 3.0 evaluation program, we decided that in order to give you proper time to evaluate if the product is really for you or not, our trial would be based on the actual days the product is used. So if you get hooked with Xbench and quickly become an avid user using it 5 days a week, you will finish your trial after some 45 calendar days. Conversely, if you are are always too busy with other stuff and only have time to check Xbench once a month, your trial will last almost 3 years. We hope you like our approach for trials. If you want to evaluate Xbench 3.0, simply go to www.xbench.net and download it. After you sucessfully complete your sign up, your 30-day trial will start automatically. Enjoy! Xbench 3.0 User’s Guide also Available in German! Posted: May 23rd, 2013 under ApSIC Xbench. We’re happy to announce that you have now available the German translation of Xbench 3.0 User’s Guide on our Documentation Section. Michael Widemann, Senior Project Manager and SDL Trados Trainer at Mareš GmbH in Munich has updated his work in previous translations with help of Trados Studio 2011 and, of course, Xbench 3.0! So, once again, we thank Michael for his great contributions for the Xbench German community and look forward to his future contributions! Xbench 3.0 User’s Guide Available in French! Posted: May 22nd, 2013 under ApSIC Xbench. We’re happy to announce that we have posted the French translation of Xbench 3.0 User’s Guide on our Documentation Section. Once again, Franck Charreire has contributed with his hard work to make this guide available to the French Xbench community. Our big thanks to Franck once again not only for his continued support on the French User’s Guide but also for his remarks to improve the English User’s Guide. Nobody reads a manual as thoroughly as a professional translator, so we’re very grateful for all his useful feedback! Posted: May 16th, 2013 under ApSIC Xbench. 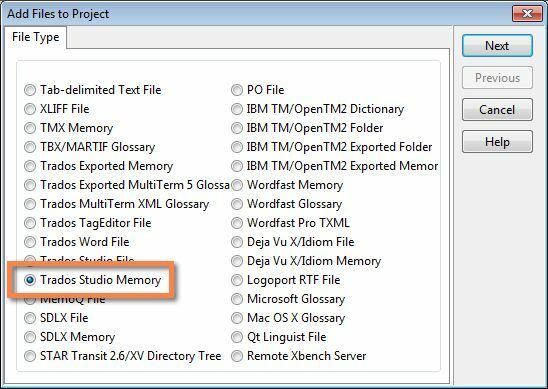 We are happy to announce that with Xbench 3.0 build 1136, we have added support for Trados Studio translation memories in .sdltm format. To add a Trados Studio translation memory to your Xbench project, simply choose the new file type in Add Files to Project, or drag and drop a .sdltm file to the File Properties window. Please download the latest build to try it out and do not hesitate to contact us if you run into any issues or have any suggestions.